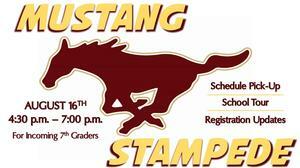 On Thursday, August 16, Magnolia Junior High will host its annual Mustang Stampede for incoming 7th graders from 4:30 p.m. to 7 p.m. This event is a way for parents to update their students' information, get details on important district services, tour the school, pick-up or purchase school supplies, and for students to pick up a tentative class schedule. It IS NOT necessary for students and parents to arrive at 4:30 p.m., but instead may show up at their convenience between then and 7 p.m. to do everything they need. Mustang Stampede is a special and informative evening for all incoming 7th grade students and parents, and we look forward to seeing you there!